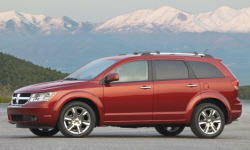 Dodge Journey Pros and Cons | Page 1 of 2 | Why Not This Car? Gets a lot of negative attention that is unwarranted in my opinion. I can understand why they still sell so many of these things, even if it has been in production for quite a long time. My description of the 2009 Dodge Jouney is 3 words- cheap,cheaper,cheapest. Excellent handling, and good manners in the road. This is a great car with excellent passenger capacity, performance, creative storage and modern styling. If we did more highway driving, it would be the ideal car. The interior of this car is beautiful. All centered around the Uconnect touch screen. All functions and features very intuitive. The interior is also very insulated from outside noise/quiet. Nice dashboard layout, textures and materials are great, the 8" touchscreen is awesome, interior lighting package is terrific. It feels much more high-end than all the other cars I test drove, including Subaru Outback, Kia Sorento and Cheyv Equinox. It has a great warranty, has been fantastic for me as my Journey has been in the shop so many times! Purchased before Chrysler went bankrupt so incentives were unbelievable. it feels a luxury car. The vehicule looks modern and rugged but yet has a stylish look. It has a different style than other crossovers. Not too high off the ground and not too low. Blends well with the new vurve in automotive styling. It is on the bigger scale of the CUV range and is nicer then the competition.